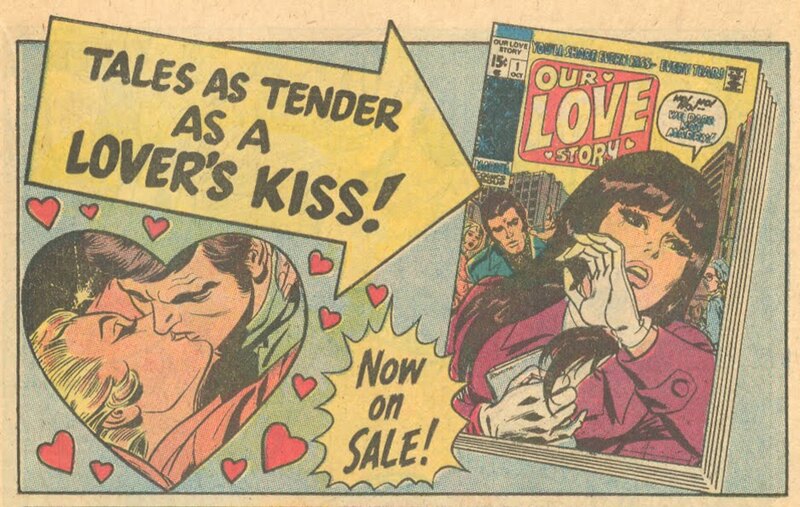 This lovely little Marvel house ad from My Love #2 (November 1969) advertising Our Love Story, serves as a reminder of the days when pre-teen girls had a plethora of titles to choose from when it came to selecting a comic book to read. Although there are some really great all ages, fun-for-all comics out there currently, it seems that many comic books geared towards females today are for the older teenage and young adult set. Yesterday I had the day off of work and I, of course, hit up the nearest comic book store while out running errands. I witnessed something that made me smile for the rest of the day. Two mothers brought their two little girls into the store who were about eight years old or so. The little ones proceeded to dig through the long boxes full of Archie's and other assorted funny animal and humor comics. After picking out about four comics each, they excitedly brought their selections up to the counter and proceeded to pay with their own money that they anxiously dug out of their Hannah Montana purses. This story may not seem like such a big deal to some, but I work in an industry (museums) that frequently asserts that "people just don't read anymore." I have never bought this silly unfounded argument, so seeing these little girls buying comic books helped to restore my faith in humanity! Ok, maybe it wasn't that dramatic -- but it sure was cute! I know this story is a tad off topic from romance comics, but I just had to share!!! Thanks for humoring me!! !